Accommodation - Discover Victoria BC, International city of adventure. Victoria is a city that has pretty much everything, including types of accommodation. Luxurious resorts, the perfect hotels for business travel or a family holiday, boutique B&Bs, hostels and campgrounds – there’s something for everyone and every type of travel. Victoria’s resorts offer stunning ocean or harbour views, luxurious rooms and five-star amenities. Beautiful pools, amazing spas and first-rate restaurants are not uncommon. In fact, they’re simply perks to the first-class service and comfort this type of accommodation offers in the city. The hotels in Victoria suit any need and budget; from high-class business travel or solo trips, to the perfect family holiday. Since Victoria is a coastal city, many of the hotels have five-star views, without the five-star price tag. Finally, whether you’re looking to stay right downtown, or are looking for a quieter section of the city, there’s a hotel that’s perfect for you in Victoria. Victoria is known for its many boutique B&Bs. A great combination of hotel comfort with a personal twist, a B&B gives way to a more intimate side of the city. 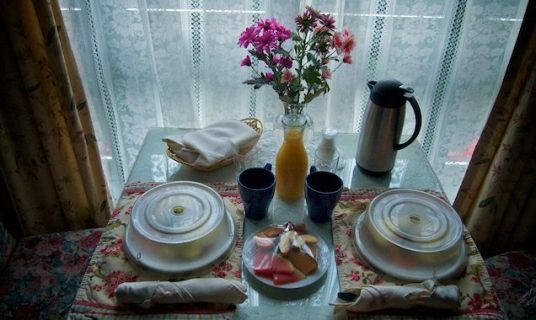 Many of Victoria’s B&Bs are located in beautiful heritage homes with personable and helpful hosts. Because breakfast is included, you can save both time and money. Most of Victoria’s hostels are located right downtown. They offer an affordable option for staying in the city. Hostels are a great option for young travellers looking to meet others and experience life in Victoria. They usually offer dorms and private dorms, a community kitchen and a games or common room. Just outside of Victoria are amazing scenes of coastal rainforest and beautiful beaches.To get back to nature, camping at any of the nearby campgrounds is a great option. Most have toilets, fire pits and picnic tables. There are plenty of trails and activities nearby.